Each year during Desert Week, we take you around the world to show you the best sights from the world’s most arid spots. We’ve also noticed over the years the large number of regions that don’t actually have hot deserts but are still quick to label any sandy or arid place a ‘desert’ and turn it into a tourist attraction, as we saw during our looks at the Desert of Maine back in 2008, or British Columbia’s Osoyoos Desert during Desert Week 2009. With that in mind, we feel this week is the best time to inform you, our loyal readers, about other such faux-deserts. Here, then, is our handy guide to some of the other notable desert impostors around the globe. We begin in the rather chilly climes of Yukon where travellers along the Klondike Highway will encounter the 2.6 km2 (1.0 sq mile) Carcross Desert. 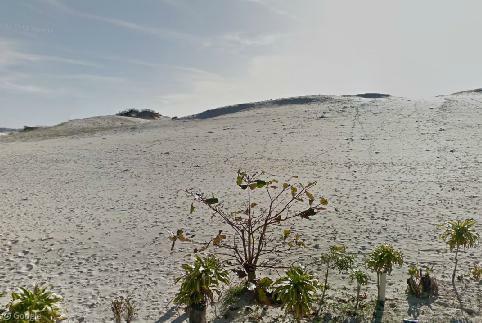 Locals call it the world’s smallest desert, but the abundance of pine trees growing out of the dunes easily disproves that. 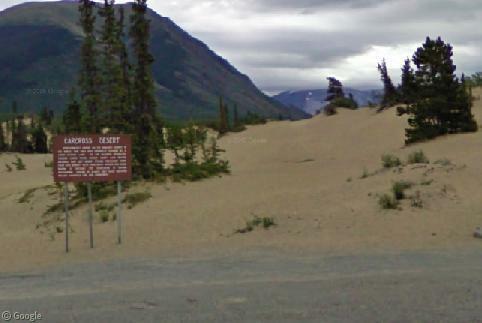 It is full of large sand dunes, however; a result of fine glacial silt blowing in from the shores of nearby Bennett Lake. Moving over to Poland, we find another large deposit of glacial sands, the Błędow Desert. Nicknamed the ‘Polish Sahara’, the Błędow is much larger than Carcross, covering 32 km2 (12 sq mi), but is only one-fifth the size it was back in the 1950s, when the sands were so large that visitors reported seeing mirages and sand tornadoes here. Similar in size to the Błędow Desert are the Oleshky Sands. 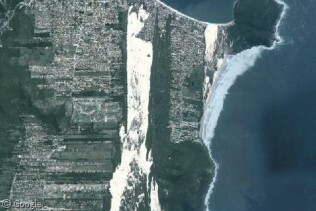 Unlike the ancient Błędow, Oleshky was formed in the 1880s after massive deforestation exposed the underlying sands. A reforestation programme is slowly taking back Oleshky to its original state, but the process will take many years that to the large sandstorms in the region that deprive plants of much-needed soil. 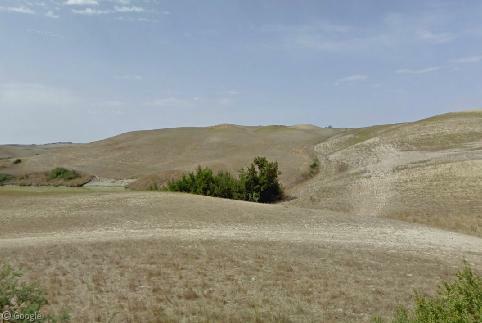 In the heart of Tuscany south of Florence lies the Accona Desert. Not only is it not an actual desert, it’s not even sandy! The entire region has been extensively irrigated for agriculture, covering the ‘desert’ in grass. That said, most of this vegetation probably wouldn’t last long left to its own devices. Comprising about one-half of the entire country, the Highlands of Iceland are often called a desert by many. Nearly devoid of vegetation thanks to the constant deposition of lava and ash, any precipitation that does fall here immediately gets absorbed into the porous, rocky ground, creating a barren landscape of black rock. 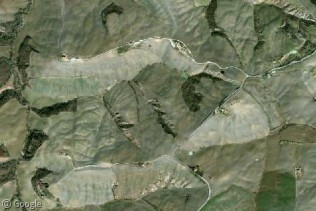 Perhaps the most dubious of all so-called deserts is the Rangipo Desert on New Zealand’s North Island. 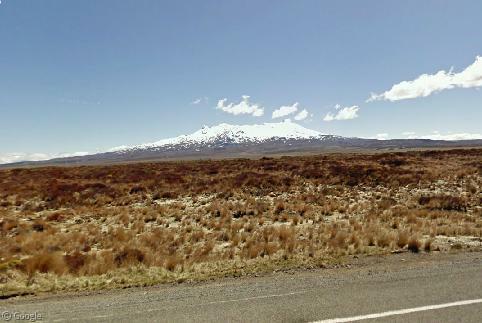 The land surrounding the east slope of Mount Ruapehu receives a whopping 1,500 to 2,500 mm (59 to 98 inches) of rain per year. That’s anywhere from two-and-a-half to four times that of ‘rainy’ London. The soil here, however, is so poor and the winds are so powerful that almost nothing more than short grasses can grow here, giving the Rangipo the appearance of a southwestern United States scrubland. 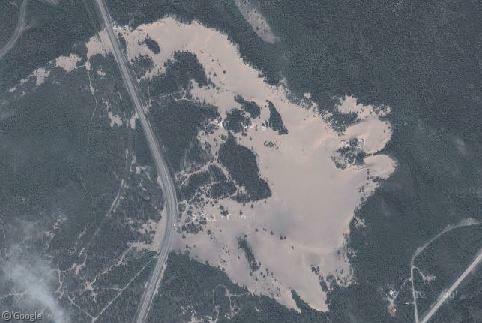 While the Brazilian city of Florianopolis is a rather humid, densely vegetated place, it may still take the award for having the most desert-like non-deserts, at least appearance-wise. The city’s island of Santa Catarina is home to wide expanses of white sands, such as the Dunas dos Ingleses and Joaquina Beach. 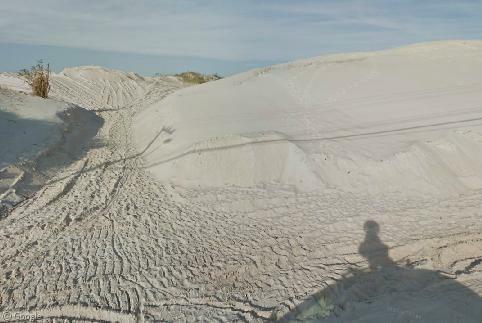 Street View gets up close with the large dunes, which are used for all sorts of recreational activities such as sandboarding. 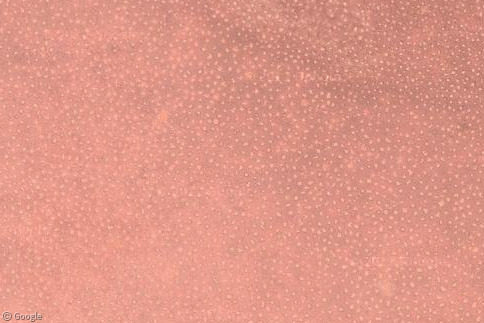 We here at Google Sightseeing remind you to be on the lookout for these desert-like impostors. Be sure to report these violators below in the comments. Well, deserts don’t need to be expanses of sand dunes. 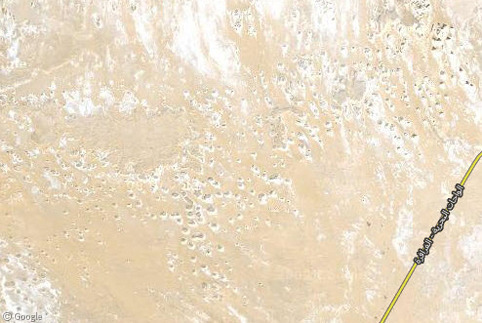 There are various definitions for various types of deserts, but one is an area that has a moisture deficit, i.e. more moisture evaporates than falls as precipitation. I reckon a few of the above would qualify in that sense … not least if you were to expand ‘evaporates’ in the definition to ‘loses’ (for example to drainage in porous rock). And if you take the definition of desert as an area that doesn’t have a sufficient vegetation cover to support human population all of the xamples listed would probably qualify. The most standard definition in scientific articles (and even then, it varies) appears to be any place with a moisture deficit and less than 250 mm (10 in) of precipitation per year supporting little to no vegetation. None of the places listed above come close to that (except maybe Accona); really they’re just places where plants have a hard time growing and so people give them the ‘desert’ nickname. You’re very much correct about sand having nothing to do with the actual definition; after all, the world’s largest desert is Antarctica!